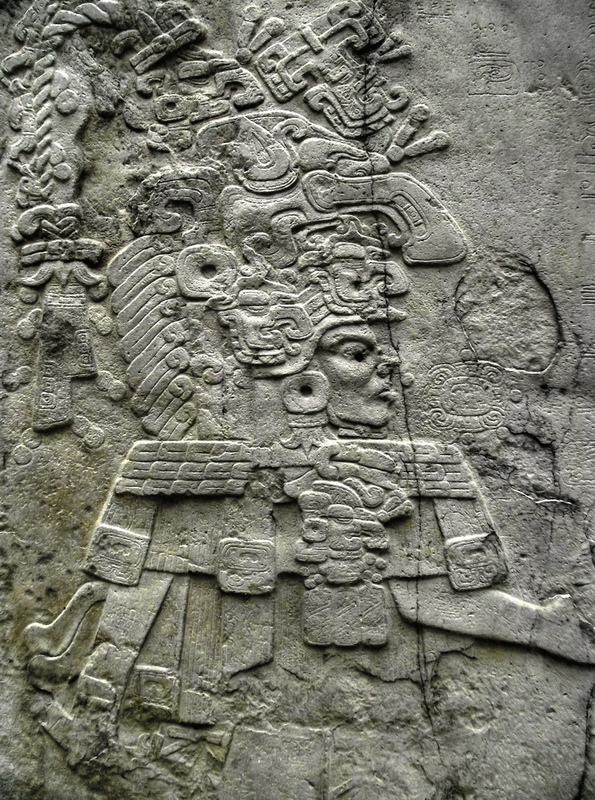 Kaminaljuyu (KJ), A-List candidate for the city of Nephi, was the largest and most important site in the Maya highlands during Book of Mormon times. It was located precisely where modern Guatemala City stands today. In 1983, utility crews excavating at the corner of 30th Avenue and 6th Street in Zone 7 found the large stone sculpture known as Monument 65. Archaeologists date it to ca. 150 BC. It depicts 3 rulers, each flanked by captives in postures of humiliation and defeat. This is the top of the stone. If KJ is Nephi, then the location of this artifact is relevant. King Noah reigned in Nephi ca. 150 BC, so the date of this artifact is relevant. The scene depicts 3 rulers seated on benches or thrones. The text describes a throne for King Noah Mosiah 11:9 and seats for his priests Mosiah 11:11. The center right captive wears a large belt, girdle, or loin cloth around his waist. Lamanites in King Zeniff's era wore leathern girdles about their loins Mosiah 10:8. The captives' hands are bound. Captives were brought bound to King Noah Mosiah 12:9 and King Limhi Mosiah 7:7-8. The captives have been stripped of their clothes. Captives in the greater land of Nephi ca. 90 BC were stripped naked Alma 20:29. 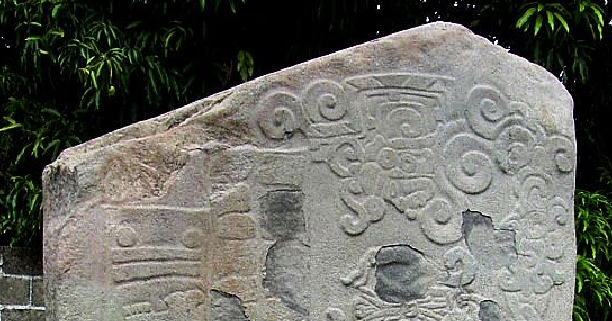 The most curious iconographic features on this stone are the 3 small circles just in front of the rulers' noses and upper lips. Other KJ sculpted pieces from this same late pre-classic time period also have the small circles just in front of rulers' noses and lips. 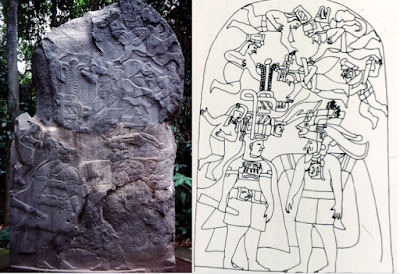 Stela 10 has 2 examples. Stela 10 was found in situ by archaeologists. It was intentionally broken into pieces anciently. 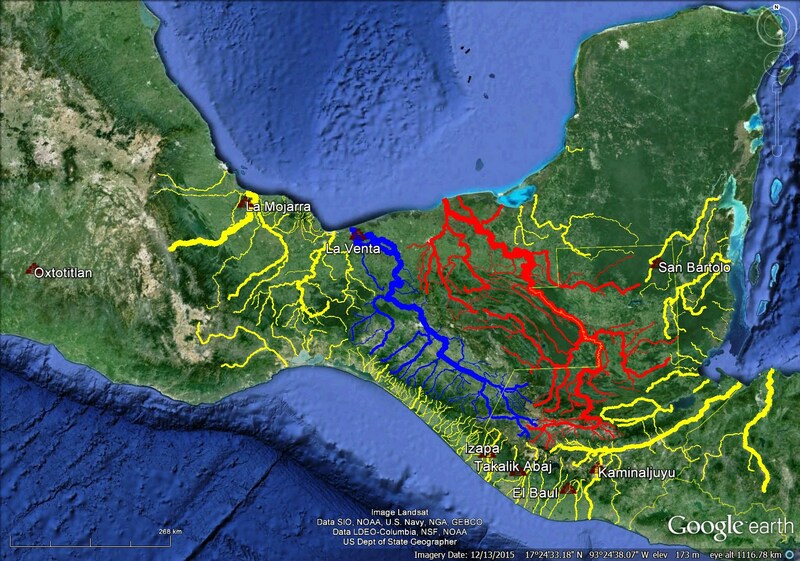 It dates to the Miraflores/Verbena phase ca. 200 - 1 BC. This is a closeup of the upper left figure showing the small circle just in front of his nose and upper lip. This figure's eyes are covered with a triune symbol known to Mesoamericanists as the "death eye." 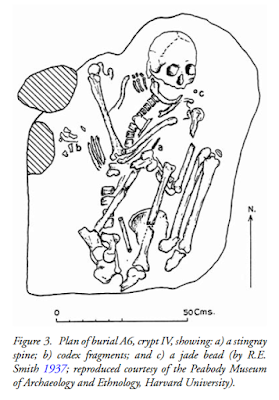 This figure probably represents a deceased person. We see the same thing on KJ Stela 11 which dates to the late pre-classic ca. 200 BC - AD 250. This is a closeup of the man in the mask. He has a small circle just in front of his nose and upper lip. About 190 kilometers west of KJ is the allied site of Takalik Abaj (TA). The best-known sculpture piece from TA is Stela 5, carved in AD 126 to commemorate the transfer of power from one ruler to another, likely from father to son. The scene depicts the two rulers flanking a double column of hieroglyphs. This closeup photo shows both rulers with a small circle just in front of their noses and upper lips. Clearly, small circles in front of elite faces was a stylistic convention in the Guatemalan highlands in the late pre-classic. We also find the motif in the lowlands at this same time period. This is a drawing of the accession scaffold from San Bartolo (SB) dated to ca. 100 BC. Mark Wright draws parallels between this scene and the coronation of King Mosiah2 on a tower as described in Mosiah 2:7. 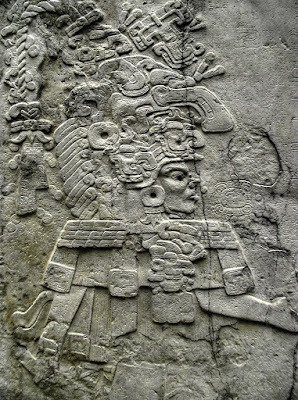 See his 2014 article "Axes Mundi: Ritual Complexes in Mesoamerica and the Book of Mormon" in Interpreter. 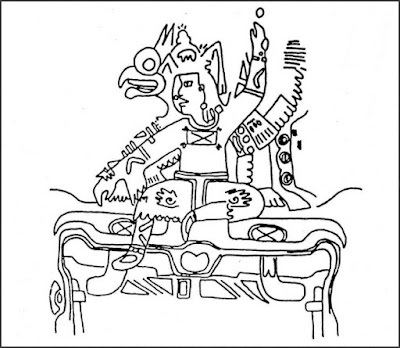 This scene depicts power being transferred form the ruler on the left to the ruler on the right who sits atop a scaffold with quincunx symbols at the joints. Both figures show the small circle just in front of their noses and upper lips. One other interesting detail about San Bartolo: the principal investigator at this site is William Saturno of Harvard's Peabody Museum. Saturno has been partially funded by the Leon & Randie Reinhart family, LDS membes from Southern California who have also supported John L. Sorenson's work. Here is Heather Hurst's rendition of a portion of another mural from San Bartolo dated ca. 100 BC. All 4 figures have the small circle motif just in front of their nose and upper lip. Several other examples are found in other portions of the San Bartolo murals..
La Mojarra Stela 1 has a clear example of a small circle just in front of an elite figure's nose and mouth.This monument, discovered in 1986 near the Olmec site of Tres Zapotes, contains the dates AD 143 and AD 156. The original is on display in the Museo de Antropologia in Xalapa, Veracruz. 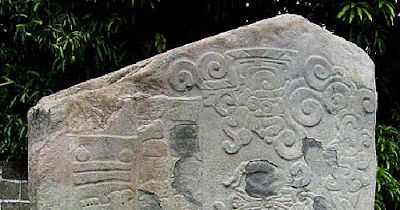 This is a closeup of La Mojarra Stela 1. 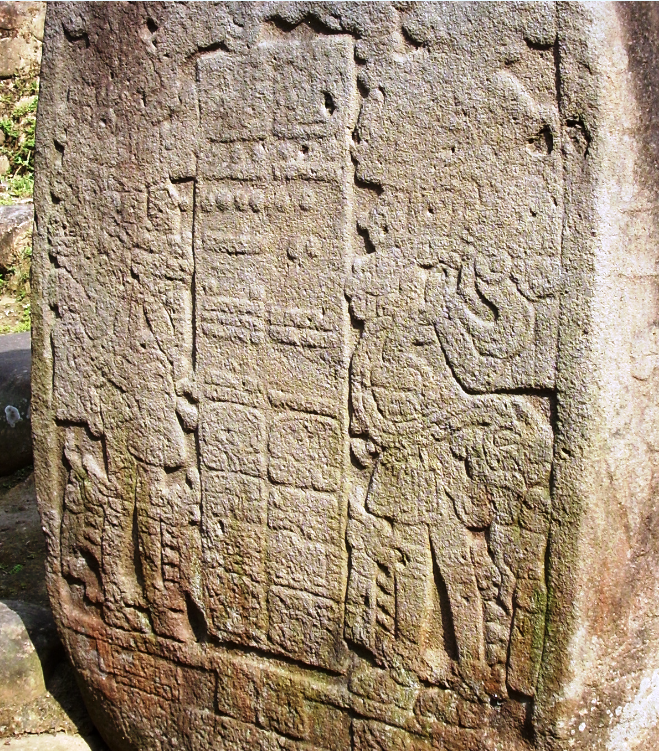 El Baul Stela 1 has another good example. The figure looking down from the heavens has a small circle just in front of his nose and upper lip. This monument contains the date AD 37. This is a closeup of the figure looking down from above. 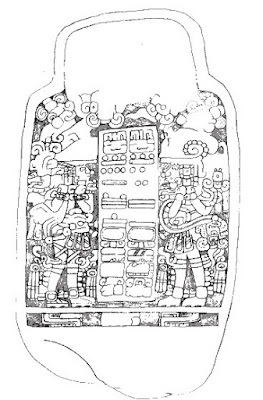 A similar scene is depicted on La Venta Stela 3 dated prior to 400 BC. 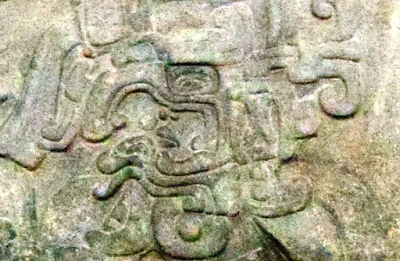 The upper right celestial figure has a small circle in front of his nose and mouth. Middle pre-classic La Venta Stela 13 has the same motif. 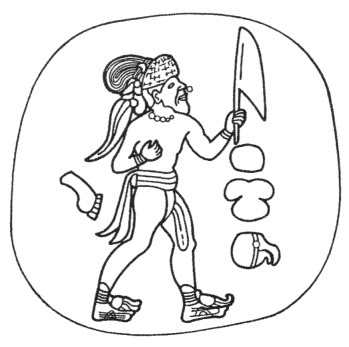 This bearded figure with plumed headdress, beaded necklace, and tasseled sandals, has a small circle immediately in front of his nose and upper lip. 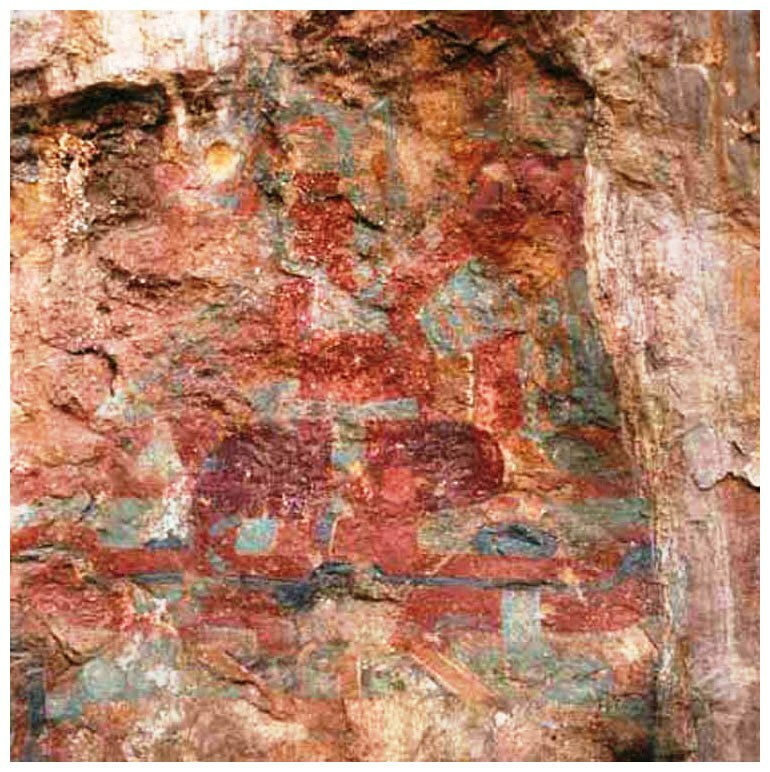 Another Olmec example dated to the middle pre-classic comes from Oxtotitlan Cave in Guerrero. This is a photo of the seated figure wearing an avian headdress with a small circle just in front of his nose and upper lip. We have just seen examples of this small circle motif on 8 sculpted monuments, 2 painted mural segments and 1 cave painting from 7 different pre-classic sites. 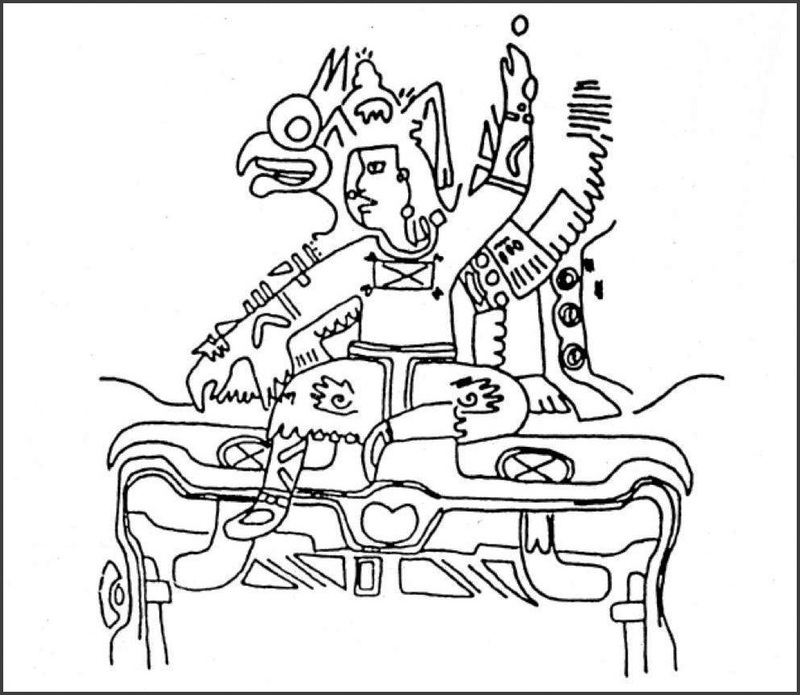 This iconographic representation continues into the classic period, although far less frequently than in earlier (Book of Mormon) times, Examples are known, for example, from Palenque, Tikal and Copan. 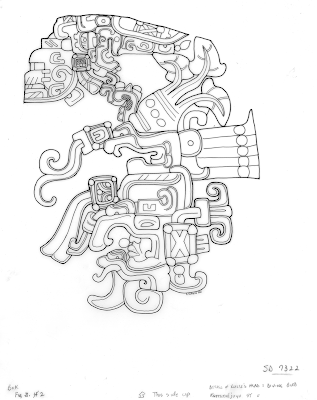 See the article "Palenque" for a particularly fine example. What is the meaning of this small circle symbol? Our interpretive models will come from the pre-classic site of Izapa and the text of the Book of Mormon. 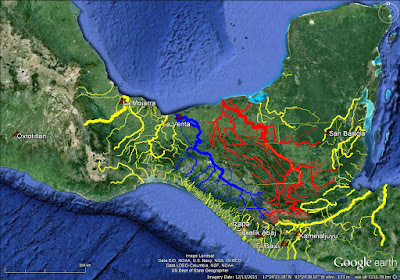 This map shows Izapa and the other 7 pre-classic sites referenced in this article. "Mound 30a and the Early Preclassic Ceramic Sequence of Izapa, Chiapas, Mexico," Susanna M. Ekholm, 1969. "Izapa Sculpture Part 1: Album," V. Garth Norman, 1973 and "Izapa Sculpture Part 2: Text, V. Garth Norman, 1976. "Izapa: An Introduction to the Ruins and Monuments," Gareth W. Lowe, Thomas A. Lee, Jr., and Eduardo Martinez Espinosa, 1982. These NWAF reports and Garth Norman's images of the carved monuments were considered definitive until 1999. 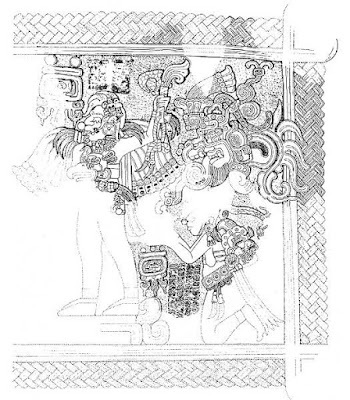 In that year John E. Clark published Ayax Moreno's low tech work in the article "A New Artistic Rendering of Izapa Stela 5: A Step Toward Improved Interpretation" in Journal of Book of Mormon Studies Vol. 8 No. 1. The precis of the article reads: "A definitive new drawing of the scene on this famous monument reveals details that demand that Latter-day Saints change some of their views." 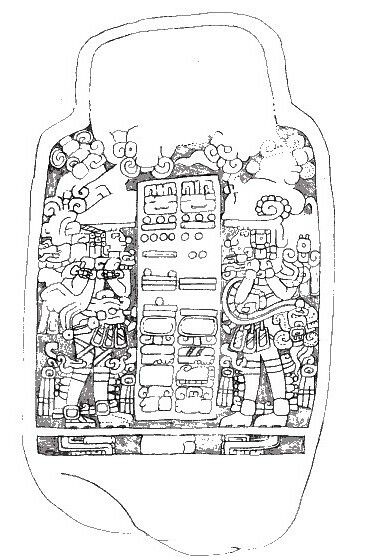 M. Wells Jakeman, chairman of the BYU Archaeology Department, began publishing inadequately researched speculations about Izapa Stela 5 in the 1950's. This led to widespread publicity as Mormons began calling the artifact the "Lehi Tree of Life Stone." As a child growing up in Mormon Thatcher, Arizona I remember people displaying large foam replicas of Stela 5 in their front yards. It was as if they were announcing to the neighbors, "I'm Mormon, and this ancient stone carving proves our book is true." The problem with low quality apologetics is the betrayal narrative when arguments fall apart under scrutiny. Some of Jakeman's claims eventually fell apart. His overzealous work became an embarrassment to more careful scholars. The Clark 1999 piece was an attempt to exorcise the ghost of Wells Jakeman once and for all by imagining blood-letting and other themes Mormons would find opprobrious on the stone. It is no coincidence that the "definitive new drawing" appeared in 1999. Jakeman died July 22, 1998. Some LDS scholars have swallowed the Clark/Moreno thesis hook, line, and sinker. During my recent trip to Guatemala, Mark Wright of the BYU Religion Faculty told our group that "Izapa had nothing whatsoever to do with the Book of Mormon." Garth Norman, on the other hand, tells anyone who will listen that Izapa was a Nephite Temple Center. 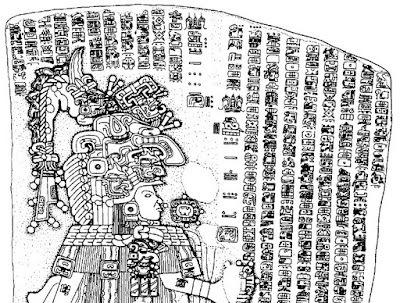 Many well-informed people in the Church continue to believe Stela 5 is the single most compelling evidence for the Book of Mormon yet found in Mesoamerica. See the article "Art and Iconography 4" to judge for yourself. In an attempt to restore his besmirched reputation, Garth Norman in the last five years has been patiently directing a major project with Jason Jones to scan all Izapa monuments in 3D. See the blog article "Imaging Izapa." This new high tech imagery substantially corroborates the NWAF 1973 drawings and shows most of the Clark/Moreno 1999 "new artistic renderings" to be mis-interpretations based on surface weathering. For that reason, this article follows Norman 1973 and ignores Clark/Moreno 1999. I have seen a large format print of the original photograph Matthew Stirling took of Stela 5 as it first came out of the ground. The high resolution 1941 photo also corroborates Norman 1973. You can see a copy of the Stirling 1941 image in the article "V Garth Norman in Mexico City." 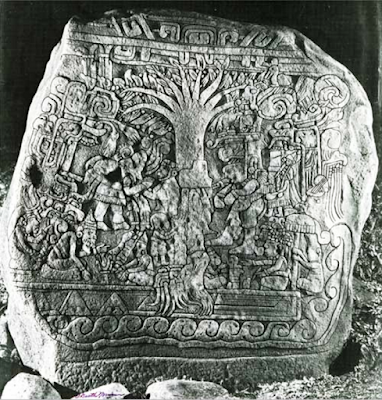 Izapa Stela 5 is the mother lode of Mesoamerican pre-classic small circle iconography, and it is very clear on that sculpture that the small circles represent the fruit of the tree of life. This is a photograph enhanced with tracing. And this is the same photo with fruits of the tree highlighted. This monument that Norman calls a "supernarrative" has at least 37 depictions of the fruit of the tree, some of them in the same location in front of a figure's nose and upper lip as we have seen in the monuments shown above. There is no question that on Izapa Stela 5 small carved circles represent fruits of the tree. 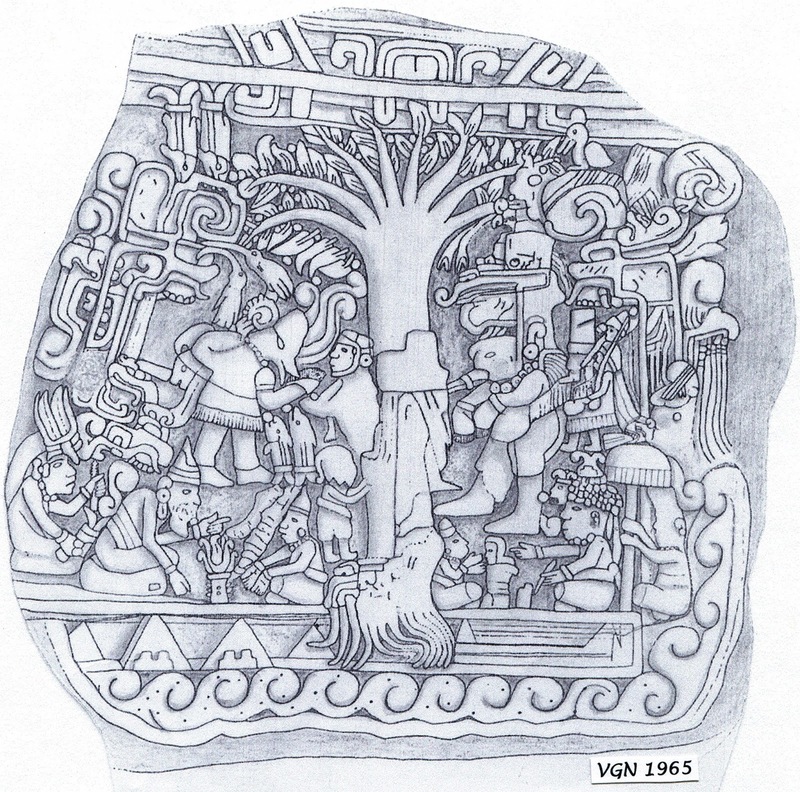 Norman states this clearly on pages 67-68 of his 1976 Izapa Sculpture text where he also references examples from Kaminaljuyu, El Baul, Tres Zapotes, and La Venta. So, trees appear in the Book of Mormon about as often as they do in the Old Testament which isn't too surprising. So, the image of a tree with fruit shows up more than twice as often in the Book of Mormon as it does in the NT, and about three times as often as it does in the OT. The tree of life shows up approximately 4 times more frequently in the Book of Mormon than it does in the OT, and approximately 13 times as often as it does in the NT. The tree of life was obviously an important symbol to Book of Mormon peoples. Finally, if we look at verses containing the three words "tree," "fruit." and "life" the disparity within the LDS canon becomes even more dramatic. All three words appear 1 time in the KJV OT, in Proverbs 11:30. They appear a single time in the KJV NT, in Revelation 22:2. These three words appear 9 times in the Book of Mormon. 1 Nephi 15:36 describes the fruit of the tree of life as desirable, precious, and a gift from God. The righteous get access to the fruit, the wicked do not. 2 Nephi 2:15 describes two trees in opposition. One tree yields bitter fruit. The tree of life bears sweet fruit. Alma 5:34 says deity invites people to draw near and partake of the fruit of the tree of life. Alma 5:62 is Alma's invitation to repent, be baptized, and partake of the fruit of the tree of life. Alma 12:21 is Antionah of Ammonihah's question about the fruit of the tree of life in the Garden of Eden and its relationship to life, death and resurrection. Alma 12:23 is Alma's response to Antionah explaining the reason God controlled Adam and Eve's access to the life-giving fruit of the tree. Alma 32:40 is Alma's warning that without faith and nurture a personal tree of life will not thrive and one will be unable to pluck the fruit. Alma 32:41 describes an anthropomorphic tree inside a faithful person that eventually bears the fruit of eternal life. Alma 42:3 is Alma's explanation to his son, Corianton about Adam and Eve in the Garden of Eden who were prevented from eating the fruit of the tree of life. One more point from archaeology. Norman in his 1976 text references archaeological field reports from the site of Chama in Alta Verapaz The January, 2016 Book of Mormon Map correlates Chama with Manti. Tombs excavated at Chama showed human remains buried with jade beads pressed to the deceased's lips. "Izapa Sculpture: Text," p. 68. 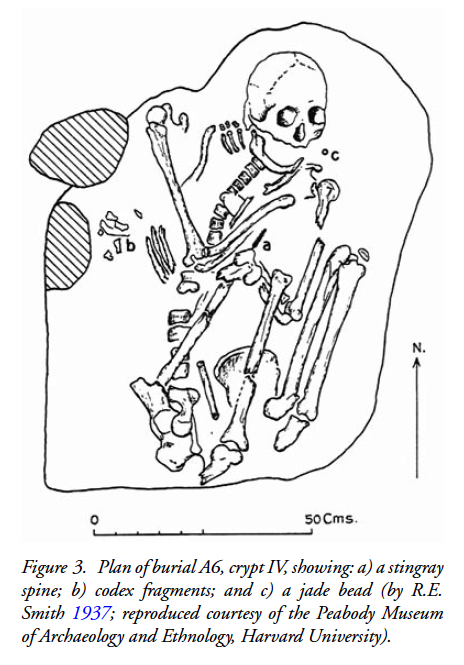 This image depicts a burial from Uaxactun with a jade bead by the deceased's nose and lips. 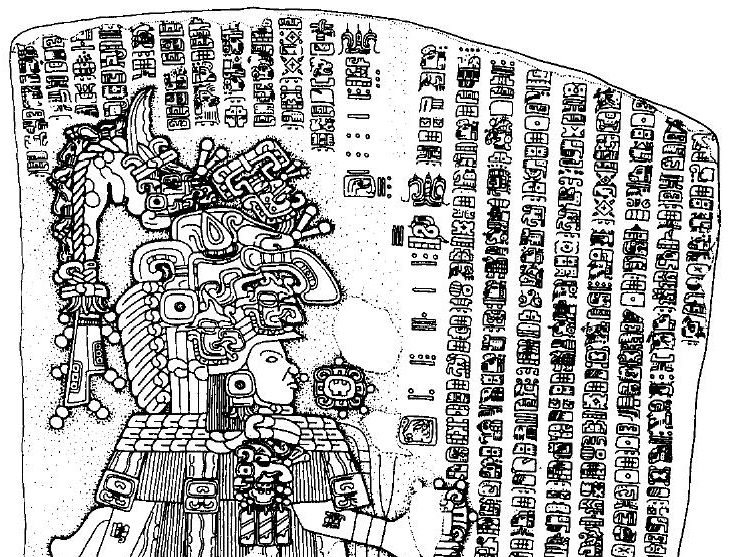 The image is from Nicholas P. Carter & Jeffrey Dobereiner, Multispectral imaging of an Early Classic Maya codex fragment from Uaxactun, Guatemala, Antiquity 90 351, 2016. The idea of a sacral tree with life-giving fruit was an important symbol in ancient Mesoamerica. Ditto in the Book of Mormon. The tree and its fruit were closely associated with deity in ancient Mesoamerica. Ditto in the Book of Mormon. The tree and its fruit were closely associated with death in ancient Mesoamerica. Ditto in the Book of Mormon. The tree and its fruit were closely associated with the afterlife in ancient Mesoamerica. Ditto in the Book of Mormon. 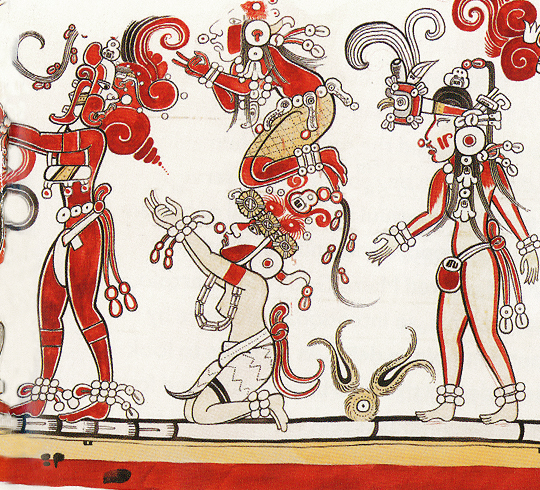 The tree and its fruit were closely associated with resurrection - corporeal rebirth - in ancient Mesoamerica. Ditto in the Book of Mormon. 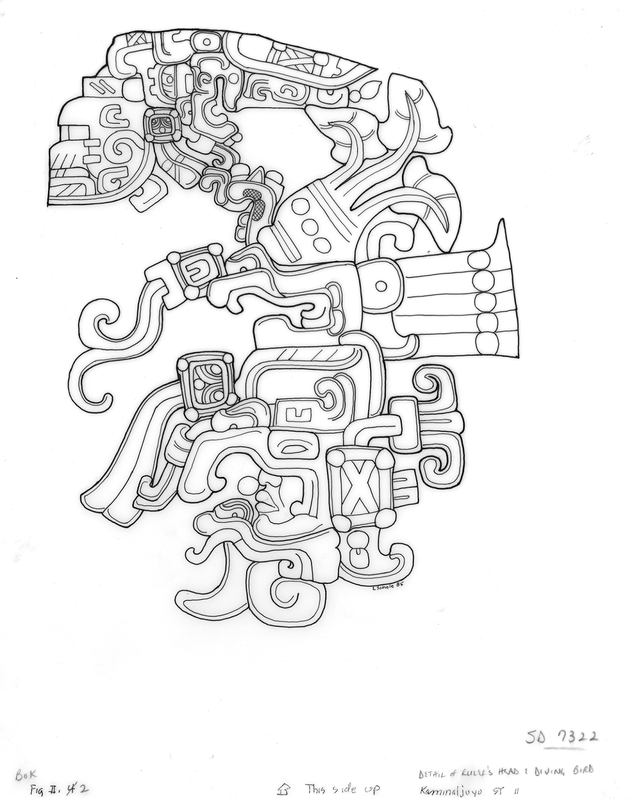 The tree and its fruit were closely associated with worthiness and one's standing before God in ancient Mesoamerica. They implied divine favor or symbolized legitimacy. Ditto in the Book of Mormon. 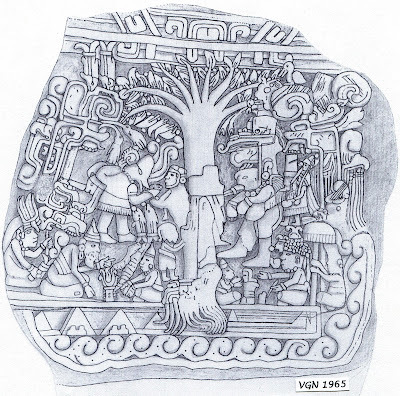 Fruit of the tree of life symbolism was well-established in ancient Mesoamerica at least as early as Olmec times. Nephite evangelists emphasized their founding narrative based on their copy of the Torah in the plates of brass and their records of Lehi's dream as they interacted with prevailing Mesoamerican religious notions. This accounts for the high incidence of fruit of the tree of life verbiage found in the Book of Mormon text. Article updated on February 3, 2018 by Kirk Magleby who volunteers as Exec. Director of Book of Mormon Central, the premiere source for reliable Book of Mormon contextual material in English and Spanish.